Catania is an ancient city, founded in 729 BC. The second largest city in Sicily, Catania sits in the shadow of Europe's highest volcano, Mount Etna, on the east of Sicily between Syracuse and Taormina. It was once called the 'city of black and white' because of the use of white marble and black lava to construct its elegant buildings, many of which have since fallen into ruins or been destroyed by war, earthquakes and lava flows. Catania boasts some interesting historical relics. There are two Roman amphitheatres, one reminiscent of Rome's Colosseum, and a 13th-century fortress, Ursino Castle, which is now a museum. The city's cathedral contains some royal tombs and was built in the 11th century. The historic downtown area, much of which dates back to the 17th-century, is a UNESCO-listed site. The city is also a great transport hub and has an active nightlife. Visitors will find plenty to do in Catania and the city certainly has attractions, but in summer tourists should beware. 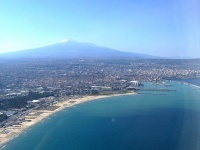 Catania is regarded as the hottest city in Italy, with temperatures often soaring to 104ºF (40ºC).